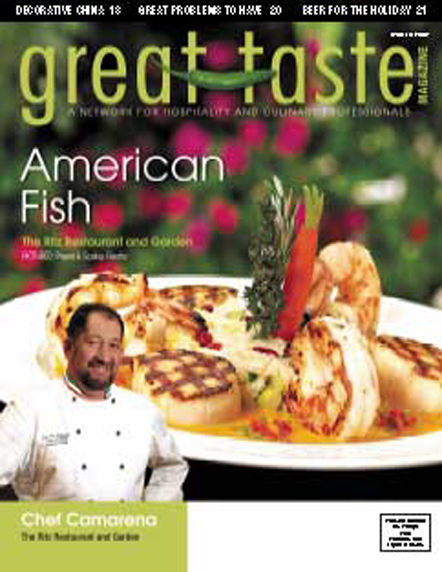 Great Taste Magazine 2007 Winter Issue features Chef Lupe Camarena and culinary news, tips, recommendations and recipes from Orange County restaurant chefs. Seafood is a staple at most restaurants and a regular dish in most homes these days, however when American Fish and Seafood Company got started just after WWII that wasn’t the case. The early days were tough but owner George Doizaki persevered, offering quality fresh seafood to his customers and his company is now the leader in seafood providers. With their 65 thousand square foot headquarters located in Los Angeles, American Fish and Seafood Co. provides seafood to many of Orange County restaurants. Shrimp is the most eaten seafood in America, and probably the most versatile. In this issue of Great Taste we offer a list of some of the best Shrimp dishes around Orange County in our Sur Le Menu. 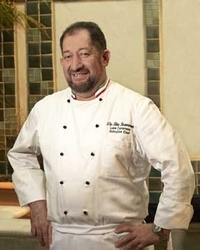 Our featured chef this month is something of restaurant royalty. Chef Lupe Camerena, of The Ritz Restaurant and Garden in Newport Beach, was mentored by legendary restaurateur Hans Prager and before him Chef Camarena was nurtured by his father who was a chef at a Mexican restaurant. 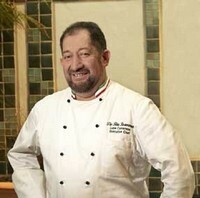 Hans described Chef Camarena as a hard worker and a sponge who soaked up everything Hans taught him. Chef Camarena offers us his story of evolution and how he keeps things fresh at The Ritz. In The Biz section of this issue we look at the returning trend of decorative tableware and offer some tips on what patterns best suit your restaurant without feeling out of date. We also celebrate Schooner’s Grille and Brewery who took on corporate restaurant chains to become a beloved staple of their community. Finally we pay tribute to David C. Tallichet, Jr. who passed away in October 2007. Tallichet was the founder of Specialty Restaurants Corporation, opening over 100 restaurants across the United States. He was a pioneer of the theme restaurant and will be sorely missed as a staple of the restaurant community. Great Taste Magazine 2007 January Issue covers the restaurants and the professionals with resources, recipes, beautiful photos and many tasty tidbits. Great Taste Magazine, the premiere connection to all the key decision makers in our local Southern California restaurant industry. Each month our 15 year-old full-color trade publication reaches thousands of the area’s top restaurant owners, general managers, executive chefs and buyers. Take a tour through the magazine. Each issue features a restaurant and local chef, and is packed with the timeliest information, critical operational tips and other industry news important to our readers.